Many people don’t find budgeting and saving easy, nor is it on top of their priority list. Most of us are programmed to look for short cuts, or believe that with a bit of luck – and rising house prices – ‘we’ll be right’. But in reality, saving for the lifestyle we want does require a degree of discipline and an active interest in looking after your finances. And one of the easiest ways to do this is by setting up some short, medium and long term financial goals. A poll by the Australian Securities and Investments Commission (ASIC)i looked at the different strategies used by successful savers. It’s clear from these tips that setting goals can give us the motivation to save rather than spend. And as we progress towards that goal, our success spurs us on to reach the end. The ASIC poll also identified that men and women have different approaches to saving and budgeting. 39% of the women surveyed are more likely than men to save for more than one thing at a time, and prefer to reach their goal in a slow and steady manner. On the other hand, 36% of men are more fast and determined, preferring to reach their goals in as short as time as possible. 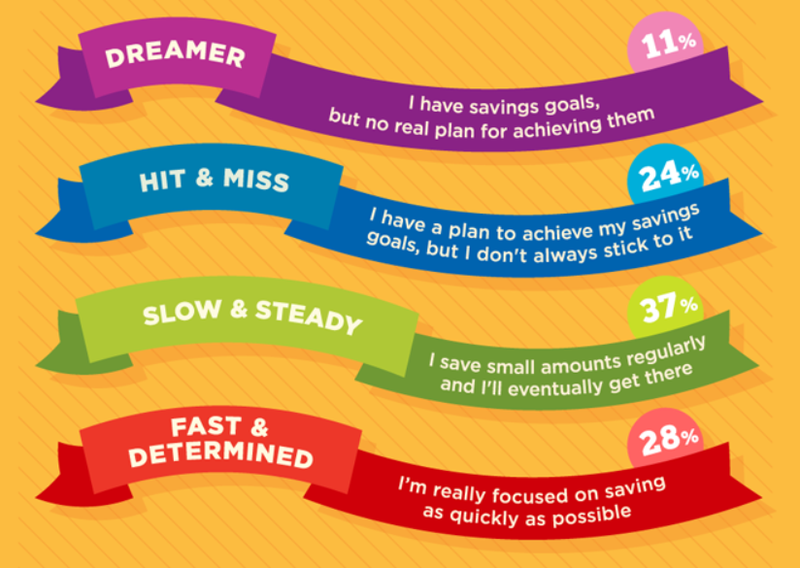 Other types of savers identified by ASIC include the ‘Dreamer’ – they have savings goals, but often fail to achieve them because they don’t have a plan to follow. Whilst ‘Hit and Miss’ savers do have a plan, they aren’t good about always sticking to it, which can end in them not always reaching their goal. Of those who took part in the poll, a holiday is a popular savings goals, matched almost equally with saving for a home. Saving for the future, emergency funds and a new car were among the other key goals, with education and a wedding also featuring on the list. When developing your savings goals, it’s crucial to be clear on what’s important to you and your situation. A goal can be whatever you want it to be – maybe you have always wanted to take a year off work to go travelling or start a business. Successful budgeting starts with identifying what you really want to achieve. And it doesn’t mean having to take on a second job or removing all the ‘fun’ expenditure. You can make regular savings by taking lunch to work, not buying that coffee every morning, or having a night at home instead of heading out. The trick is to put those savings deliberately away so they become tangible. Try transferring the money you might have spent on those things into a high interest savings account, as and when you don’t spend it. Most banks don’t charge for these types of transfers and even small amounts can help towards your goal. As well as using the tips above, another way that can help make saving for your goal that little bit easier is to consider setting up an automated bank transfer into your savings account each payday. This way, you don’t have to remember to do it yourself, and you might be less likely to ‘miss’ the money. All of these strategies can help you towards achieving the lifestyle that you want. But sometimes we might need a bit more help getting our finances sorted. Contact us to find out how we can help you focus, set and achieve both your lifestyle and financial goals.